Few economic development projects stretch 330 miles across 19 counties, four cities and nearly 70 venues. That’s the Crooked Road, Virginia’s Heritage Music Trail. 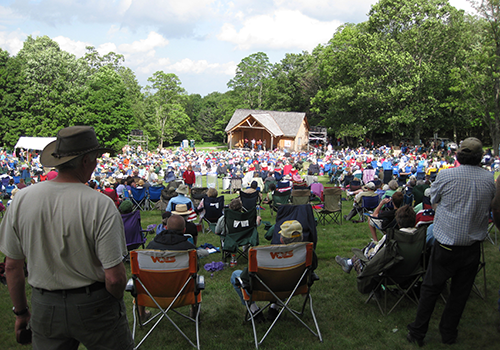 One big festival will take place June 8-16, all along the Crooked Road, from Ferrum to Breaks Interstate Park, with 24 concerts, 70 cultural events and three “feastivals” — events that mix food and music. The event is called the Mountains of Music Homecoming. Visitors also will be contributing to the regional economy. The Crooked Road had an economic impact of more than $9 million in 2015, according to a study by Virginia Tech’s Office of Economic Development. Each year’s event has a theme. This year’s theme is “In the key of blue.” That title is supposed to evoke bluegrass and the Blue Ridge, but it’s also a reference to the blues and the African-American influence on music, food and culture in the mountains of Southwest Virginia. The musical influence reaches back centuries. The modern banjo, for example, evolved from instruments brought from Africa by enslaved people. In the early 1900s, African-American guitarist Lesley Riddle helped A.P. Carter gather songs for the Carter Family. The African-American influence on this festival extends to the program guide, with cover art by Chilhowie artist William Fields and an original poem contributed by Nikki Giovanni, renowned poet and University Distinguished Professor of English at Virginia Tech. Jimmy “Duck” Holmes is the festival’s big blues player, along with National Heritage Fellow Phil Wiggins and Blues House Party.